Chen Style Tai Chi Chuan is generally accepted by martial arts scholars as the source style from which all other systems of Tai Chi derive. It is still practiced in the small farming village of Chen Chia Kou in Henan Province, China, by the lineal descendants of the founders. 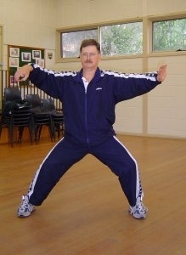 Chen Style combines the slow controlled movements typical of Tai Chi together with fast explosive movements. It is based on a very profound understanding of human body movement and is a great gift to the world from Chinese culture. After I returned to Japan in 1984, I hoped to keep up my practice of Yang Style Tai Chi Chuan. I started a small Yang Style Tai Chi club in Kisarazu, Chiba Prefecture, at a local Community Center. Very conscious of the fact I had only scratched the surface of Tai Chi, for over two years I searched for a teacher who could help me improve. I met numerous teachers from several different styles, but failed to find a teacher whom I felt comfortable with. Luckily, through the good offices of a friend and colleague, Ellis Amdur, I heard about a teacher in Chiba Prefecture who was said to be very good. I found that the teacher was a Zen priest living near Mera, a small fishing village at the entrance to Tokyo Bay. This was Yamaguchi Hakuei Sensei, who had spent several years in Taiwan studying Chinese Martial Arts under the guidance of Adam Hsu of Grandmaster Liu Yun Chiao’s Wu Tang organization. During Yamaguchi Sensei’s time in Taiwan, he studied Tang Lang (Praying Mantis), Hsing-I (Mind Intent), Pa Kua (Eight Trigrams), Mitsung-I (Labyrinth Boxing) and Pa Chi-Pikua, as well as Yang style Tai Chi. Yamaguchi Sensei’s keen interest in the origins of Tai Chi led him to be one of the first outsiders to visit Chen Village after China began to open up in the early 1980s. He was so impressed with what he saw that he stopped his practice of the other arts to concentrate on Chen Style Tai Chi. I first met Yamaguchi Sensei on a cold winter day in January, 1985. I drove down to Mera with my family and was very kindly received by Yamaguchi Sensei and his wife. After some Martial Arts discussion he asked me if I would demonstrate my Tai Chi for him, and that he would do the same. I prefer to forget about my own demonstration. Suffice to say that his demonstration was so impressive that I was immediately hooked. The hard/soft nature of Chen Style, and its dynamic spiralling movements and explosive power had a great appeal for me. It snowed that evening and due to the weather it took me seven hours to drive back to Kisarazu, but I made the two hour drive down to Mera the next day for my first lesson, and continued training with Yamaguchi Sensei for the rest of my stay in Japan, about fifteen years. I always left after the lesson feeling the effort to get there had been more than worthwhile. Yamaguchi Sensei was an outstanding teacher who had the gift of being able to make difficult concepts readily understandable. His body control was truly impressive and he would demonstrate the same techniques with different interpretations. During those fifteen years, I was lucky enough to have many private and semi-private lessons with him and go on regular gasshukus (training camps) every spring and autumn. I also attended seminars by Chinese teachers who came to Japan regularly. After a few years of training, I switched over completely to Chen Style and my small club in Kisarazu followed. I encouraged them to attend the regular training camps and tried to bring Yamaguchi Sensei to Kisarazu several times each year for one day seminars. Currently they continue to train under my senior students, and Yamaguchi Sensei comes to Kisarazu once a month to teach. Thanks to Yamaguchi Sensei, I was able to learn Chen Old Style as done by Wang Xian Sifu, and the New Style as done by Chen Xiao Wang Sifu. During the approximately 15 years I trained with Yamaguchi Sensei, I was able to attend a number of seminars in Japan given by these two great teachers. I visited China in 1992 to train in the First Old Form and learn the Second Form (the so-called Pao Chui or Cannon Fist) from Wang Xian Sifu. In 1999 I helped organize a trip for about a dozen of Yamaguchi Sensei’s students to Australia to train under Chen Xiao Wang Sifu. We reviewed the First New Form and relearnt the Chien (Straight Sword) Form.